Bartholomew, Craig G. Contours of the Kuyperian Tradition: A Systematic Introduction. Downers Grove, Ill.: IVP Academic, 2017, pp. 363, $40.00, hardback. In the United States, theologically conservative Christianity seems to stand at the edge of a major shift in political theology. The so-called Judeo-Christian consensus for public theology and ethics have eroded. Around the world, the epistemological foundations that have generally been assumed are frequently challenged. Especially in the United States, the culture is rebalancing toward a totalizing view of economics and politics. Since the vast majority of the Christian tradition of writing on cultural engagement occurred in situations of relative dominance of Christian consensus, there are too few examples of effective engagement in a pluralistic context. Among the limited list of positive examples Lesslie Newbigin, Francis Schaeffer, and Abraham Kuyper are near the top. Unfortunately, until recently, only a limited amount of material in the early Kuyperian tradition has been available in English. That is quickly changing, which makes Craig Bartholomew’s recent book, Contours of the Kuyperian Tradition, a timely and valuable volume. Bartholomew sets the table for the book in his introduction, where he outlines the basic Kuyperian program, which entails seeking the welfare of the city. The Kuyperian tradition is one that is primarily outward looking. Chapter One details Kuyper’s conversion from liberal, cultural Christian to Reformed orthodoxy. In the second chapter, Bartholomew summarizes the ideas of creation and redemption in the Kuyperian tradition. These concepts are central in understanding that tradition’s vision for the scope of what should be, what is, and what one day will be. Similarly foundational, Chapter Three surveys the high view of the authority and veracity of Scripture in the Kuyperian tradition. Bartholomew is careful to indicate that Kuyper rejected notions such as mechanical dictation, but held the Bible as received in high esteem and ascribed ultimate authority to it. The fourth chapter reflects upon the centrality of the idea of worldview among those that follow Kuyper. This chapter alone is worth the price of the book as Bartholomew deftly undermines the popular critiques of worldview as a tool for cultural understanding. Chapter Five marks a shift in the discussion, as the chapter topics become less foundational and more topical. This chapter explains and critiques the idea of sphere sovereignty, which is the most often recognized but often least understood aspect of the Kuyperian tradition. In the sixth chapter, Bartholomew explains the importance of the concept of the universal and local church for Kuyper and his disciples. Chapter Seven engages with the robust and often ignored emphasis within the Kuyperian tradition on political engagement, concern for the poor, and efforts to live in a pluralistic society. The reader cannot help but wonder if much of the cultural warfare of the past half century might have been minimized if Kuyper’s work had been more readily available. The eighth chapter touches on the center of Kuyperianism, which is an emphasis on holistic mission. Chapter Nine surveys the significant contributions of Kuyperian philosophers ranging from Kuyper himself to contemporary giants like Alvin Plantinga. In the tenth chapter Bartholomew provides an overview of the major theological themes in the Kuyperian tradition, as well as the significant theological emphasis that undergirds the writing of those in the tradition. It is impossible to understand Kuyperianism without understanding the theology from which the practical applications sprang. Chapter Eleven summarizes a Kuyperian vision for education. This chapter is helpful and offers a strong apologetic for the value of the unified worldview of a truly Christian university. Some of Bartholomew’s recommendations in this chapter, however, tend toward the speculative and Eurocentric, such as his plea for a three-year university track based on Jesus’ three year equipping of his disciples. In the final chapter, Bartholomew notes the impossibility of fulfilling the Kuyperian social program without individual spiritual formation, which is sometimes a less developed element in contemporary expression of Kuyperian themes. The book closes with a postscript outlining resources available for studying the Kuyperian tradition. This volume is billed as a systematic introduction. It satisfies the claim of systematization quite well. The structure is logical and helpful for those reading through the volume for the first time and also for those seeking a focused explanation of the trajectory of the Kuyperian tradition on a particular topic. However, the volume will most significantly benefit those who have already have a moderate awareness of the major figures in the Kuyperian tradition. To be truly introductory, the volume would have needed an early chapter surveying the timeline of the whole tradition, especially those figures that are frequently mentioned in this text. This is an invaluable resource for understanding the Kuyperian tradition, but it does not serve as a primer for the field. 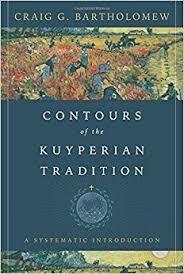 Contours of the Kuyperian Tradition is a very well-written and timely book that should be read widely. There is a major project afoot to get Kuyper’s works translated into English and widely available. These efforts, facilitated by Lexham Press, Acton Institute, and the Abraham Kuyper Translation Society, are broadcasting a vision that promises to be helpful to Christians navigating sometimes hostile but indubitably broadly pluralistic cultural channels. Batholomew’s volume is indispensable as a chart for the Kuyperian tradition and should be read alongside the recent and forthcoming translations.